On Friday, November 6th teachers from the Federation schools gathered at Blessed Teresa of Calcutta for their Professional Learning Team meeting. The teachers heard from two speakers that afternoon, Heather Davidson, LCSW, Director of Youth Services for SSM Health St. Vincent's Behavioral Health at De Paul Hospital and Molly Murphy, MAT, SPE, Non-Public Diagnostics with Special School District. These expert speakers provided tips and techniques for teachers to use in their classrooms to help identify and respond to special needs of students, how to communicate with parents, when to refer for testing, etc. Both presenters were also available for Q&A and provided contact information for future questions. St. Angela Merici Classroom Saints - Each grade level at St. Angela Merici School is choosing a saint to learn about this month. They will each decorate their classroom door with a summary of their chosen saint's life, and will celebrate that saint's life with their actions. 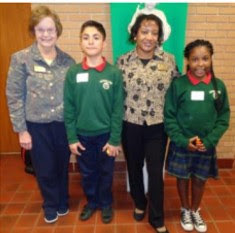 5th grade students at St. Rose Philippine Duchesne School recently presented the lives of several saints to their fellow students. They each memorized a brief summary about their chosen saint, and delivered to the audience as if they were the saint. A few also presented to the congregation at 10:30am mass on Nov. 1, All Saints Day. Sacred Heart Students Going the Extra Mile - Sacred Heart School is hosting Mission Week Nov. 16-21. The theme is "Go the Extra Mile for Mission." It takes 84,480 pennies side by side to make a mile, so the goal is to raise $845 for the missions. All week long there will be opportunities for students to donate money which will go to various missionaries. 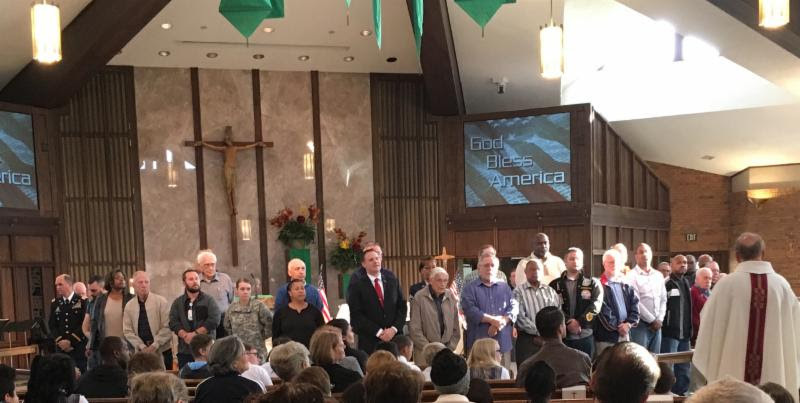 St. Norbert Students Honor Veterans on Veterans Day - On Wednesday Nov. 11, the feast of Martin of Tours, patron saint of soldiers, the St. Norbert school and parish community honored Veterans at Mass. "We are grateful to them and so proud of their wonderful service to let us realize that we are the land of the free and the home of the brave," said Mr. Watkins, principal. St. Ferdinand Advent Concert & Grandparents Day - St. Ferdinand students in preschool, kindergarten, 1st, 3rd, 5th and 7th grades are preparing for a special Advent concert on Wednesday, December 9. There will be two performances: one in the morning for grandparents and special guests and another in the evening for parents and other parishioners. Keyboard club. 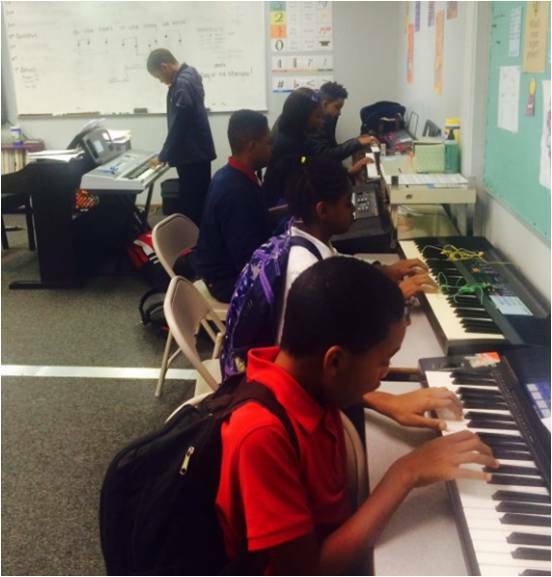 The students in Keyboard have learned that if you take a complicated piece and split it so that everyone has a part, it comes together and sounds great. The students will perform for their parents, family and friends at their Christmas Concert on December 17th at Trinity High School! BTC Students Hit the Stage - Blessed Teresa of Calcutta students performed Disney's Alladin Jr. on Nov. 12. Students worked to prepare and produce the show with the help of Stages St. Louis. Prepare for CHRIST through nine days of Prayer. 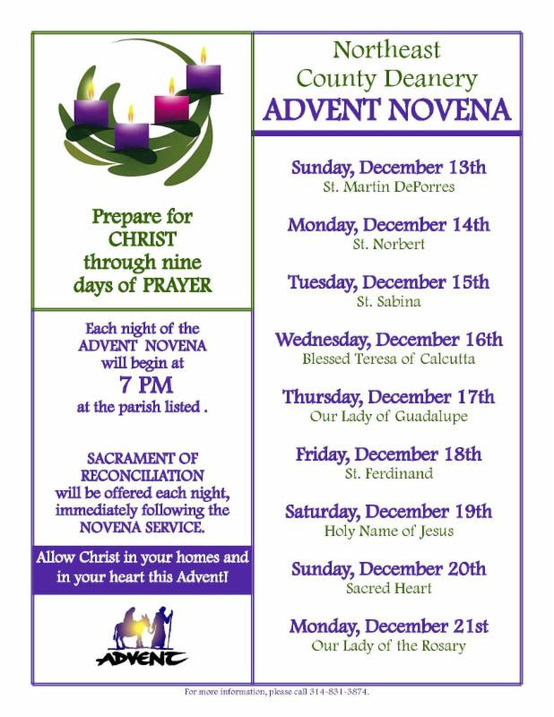 Each night of the Advent novena will begin at 7pm. The sacrament of Reconciliation will be offered each night, immediately following the Novena Service. November 21 - Sports Trivia in Sacred Heart Gym, email todonnell11@sbcglobal.net to reserve a table. November 26 - St. Ferdinand Thanksgiving Dinner - free to all in the community. For more information or to make a donation, contact the rectory at 837-3165. November 22 - Deadline for Poinsetta Sale benefiting St. Norbert 8th grade class of 2016. Contact Stacy at 314-313-7202 with questions. December 4 - Texas Hold-em Tournament sponsored by St. Sabina Mens Club - For reservations call Gary at 314-838-1411. Beyond Sunday Capital Campaign for Catholic Education - Learn more about the historic capital campaign that all parishes of the Archdiocese are participating in within the next year. Currently St. Rose Philippine Duchesne and Sacred Heart parishes are sharing this opportunity to make a difference with their parishioners.